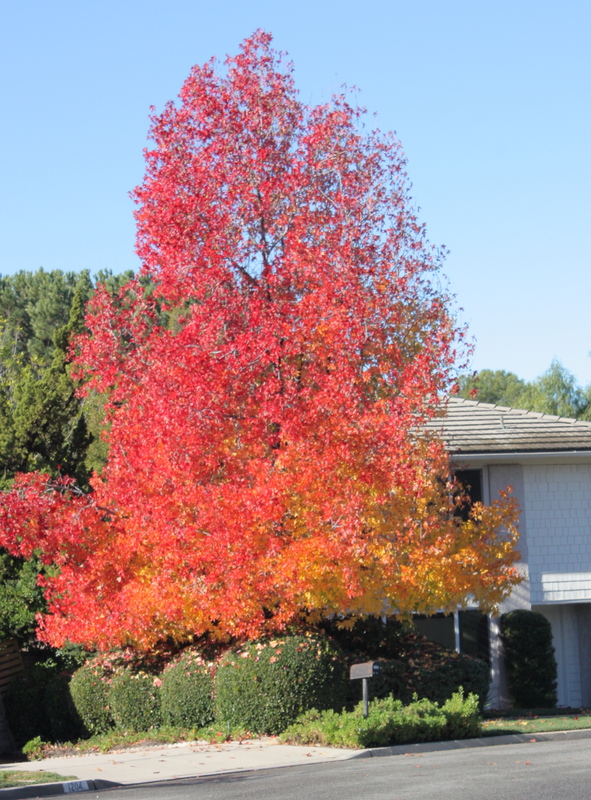 This time of year, the bling in our southern California landscape is often coming from seasonal decorations—the red bows, the shine from the holiday lights, the texture of evergreens, real or not, hung from doors and draped around mailboxes. But there’s another source of (to borrow What Not to Wear‘s mantra) color, texture, pattern and shine that’s longer-lasting, and which doesn’t have to be put up or taken down at an already busy time of year: berries. 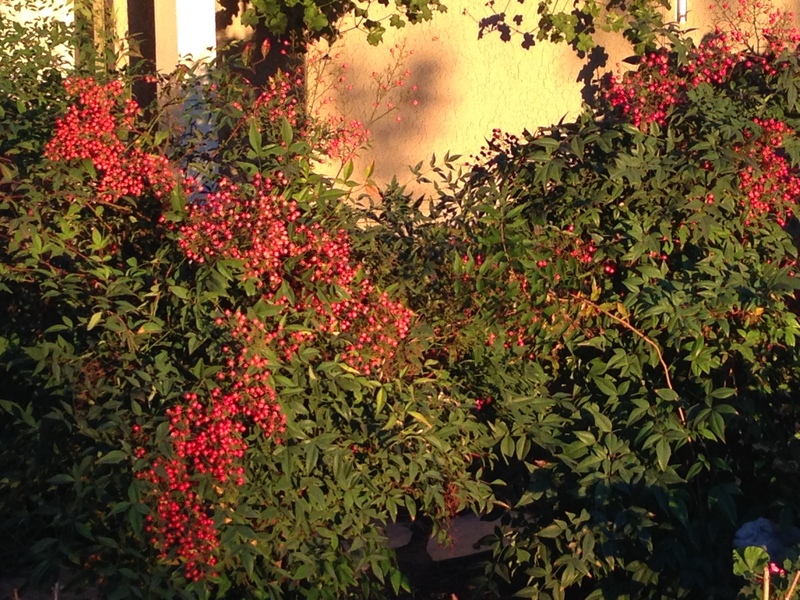 I love berries; I love all the fruits and drupes and hips and haws that manifest themselves this time of year; it’s wonderful how much interest they add to our outdoor surroundings. And if you plant them in your own landscape, that’s not all they’ll add; you’ll have a whole new level of color and texture in the wildlife that shows up to eat your berries. 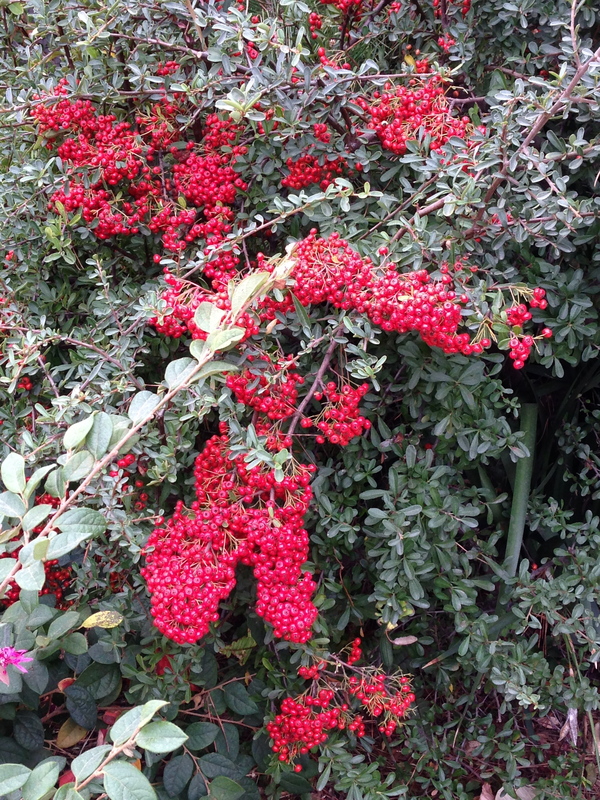 There are many colors and varieties to consider; right now pyracantha is making its vivid display everywhere you look. It’s a cast-iron plant—pay attention and you’ll see how often the really big, showy ones are on a neglected bank or are part of the edges of yards where nobody looks (or waters). 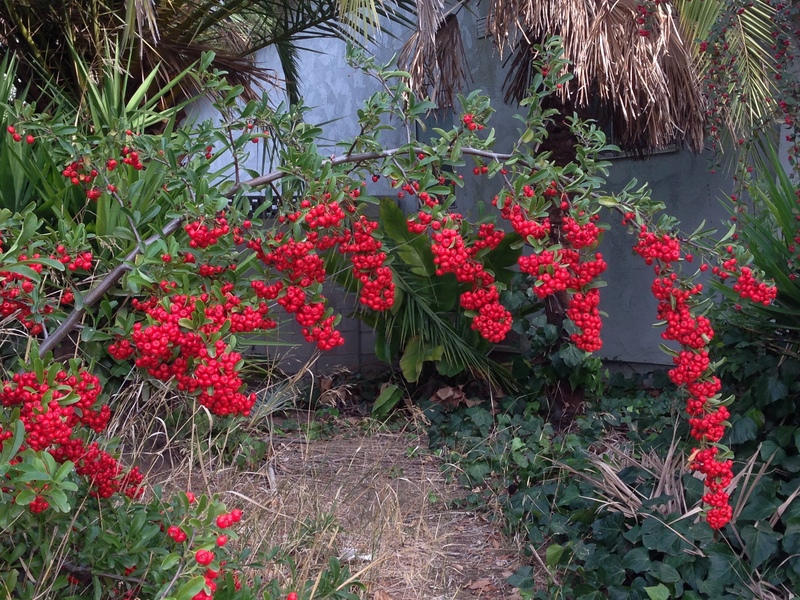 Pyracantha doesn’t care. It just keeps on putting on its spectacular show from November till late spring or longer. 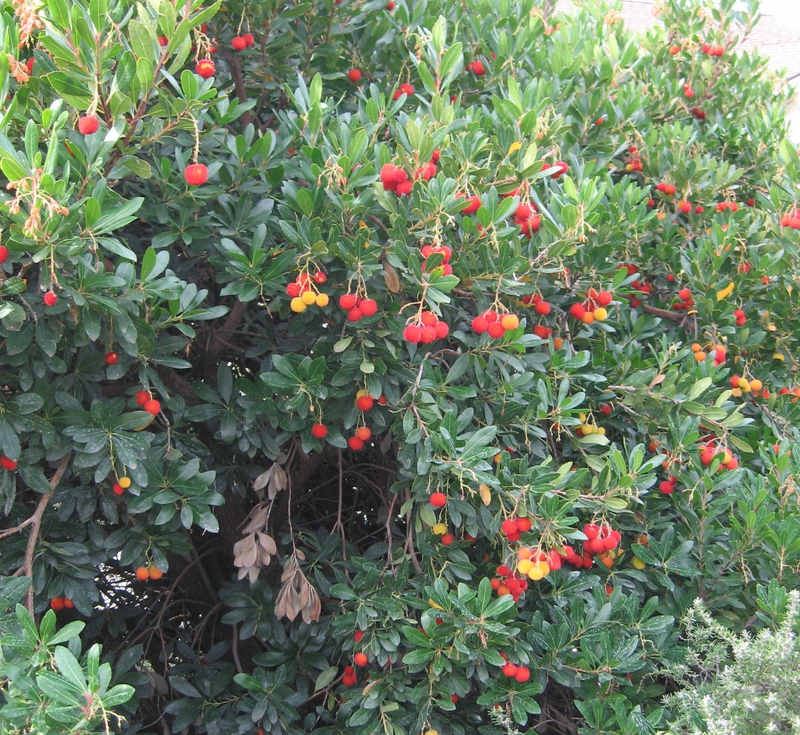 It’s also one of the shrubs Neighborhood Watch experts advise you to plant beneath windows to keep people out; it’s spiny, hence the common name “firethorn.” The spines also mean birds love to use it for cover. If you’d like to add one to your yard or your own neglected bank, this is a great time of year to make your selection, as the shade varies–below, a very orange variety on an untended slope near us. Thanks to Mike, our neighbor and plant expert, for the positive ID on this pistache! 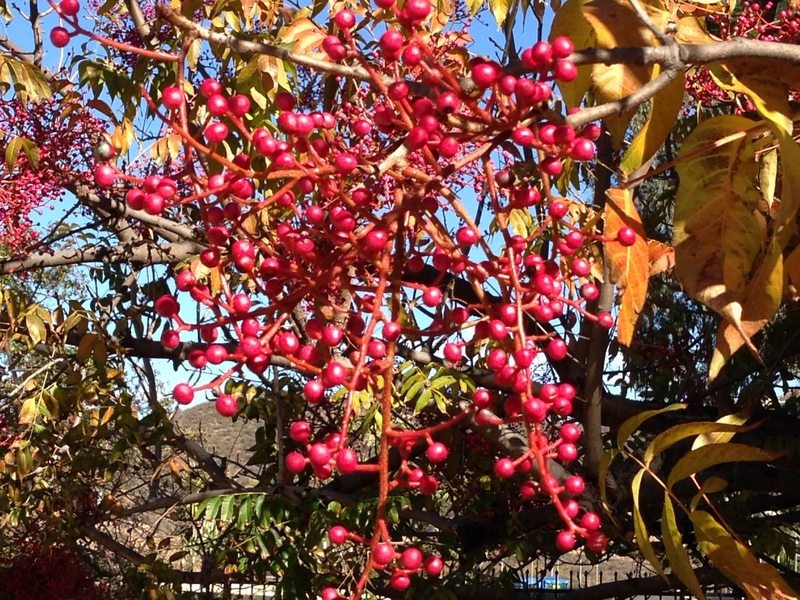 There are lots of other tough plants that will give beautiful, wildlife-attracting berries all fall and winter. 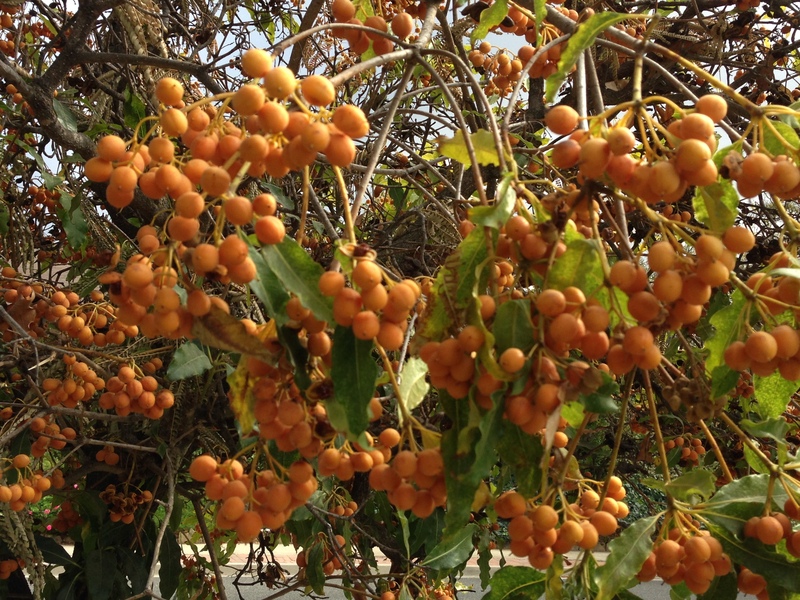 One of my favorites, the tough, totally-taken-for-granted raphiolepsis or India hawthorne, has beautiful berries; I took the picture below in a medical complex parking lot. Notice this one’s fruiting and flowering at the same time! The sweetshade tree (Hymenosporum flavum) is a no-maintenance selection that’s been overlooked in landscaping for too long and is due for a comeback. 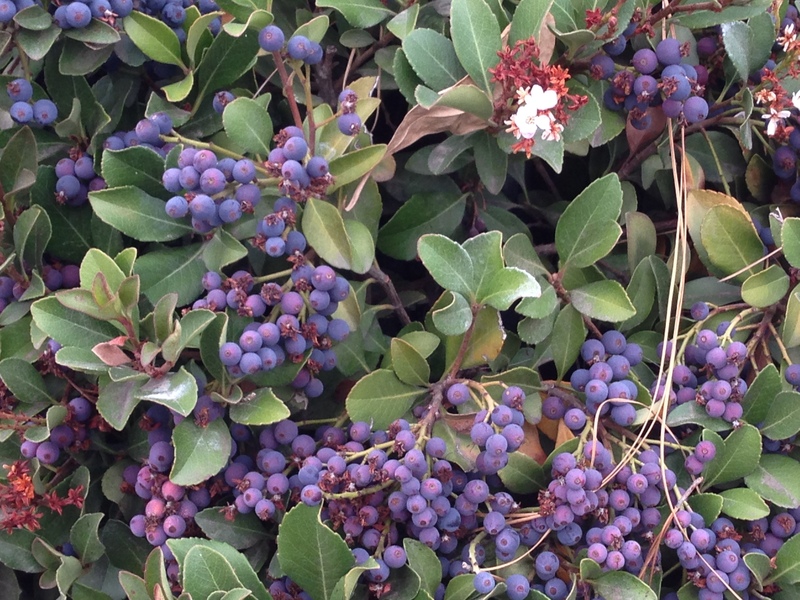 I will wax eloquently about its fragrance in the spring, but for now, check out its fall berries! Okay, I could go on . . . but I hope I’ve convinced you to notice and enjoy the berries around you—once you start looking, you’ll see they’re everywhere. This seems to be a very berry-ful year, which is strange considering just how little rain we got last year, but perhaps the plants are putting their last-ditch survival mechanisms into play. At any rate, enjoy the literal fruits of their labor, and consider which ones you might like to add to your own garden environment. And let me know any favorites of yours that I’ve missed! Succulents are having a moment. A fairly extended moment, which means garden designers writers are really reaching for ways to use them. 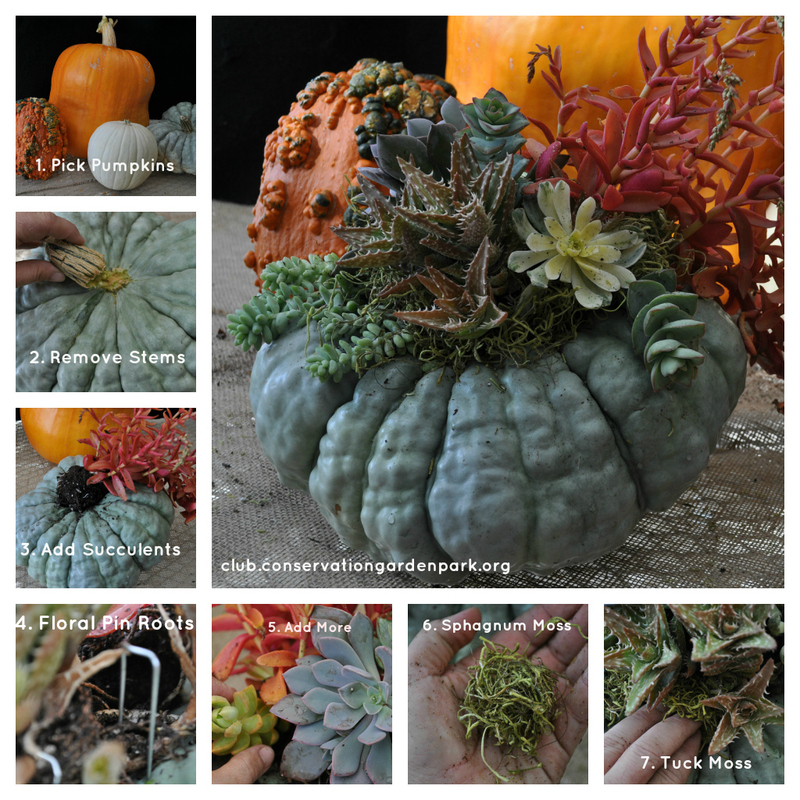 October’s pumpkin-as-succulent-container craze was a perfect example of this; I personally am gobsmacked that anyone has the discretionary time, especially at this time of the year, to fiddle with floral pins and sphagnum moss. Though they do look pretty cool, and if anyone wants to make me one, I’m up for it. 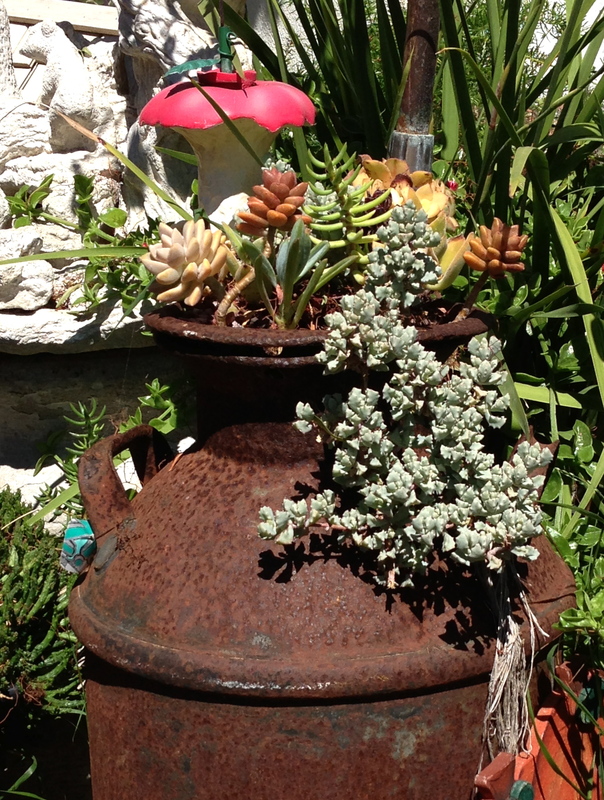 But it is certainly great proof of how succulents will adapt to all kinds of creative situations; they’re a great artist’s tool. Too, succulents will adjust to just about any container, which means if you’re the kind of person who can’t say no to a thrift-store find of a rusty Dutch oven or delicate teacup, you’re in luck. Now you can justify your habit because you can stuff succulent trimmings into your treasures; they’ll take root and flow down the sides, and people will admire your panache. If you want more crafty ideas for using succulents, set yourself up a Pintrest board and prepare to be amazed. 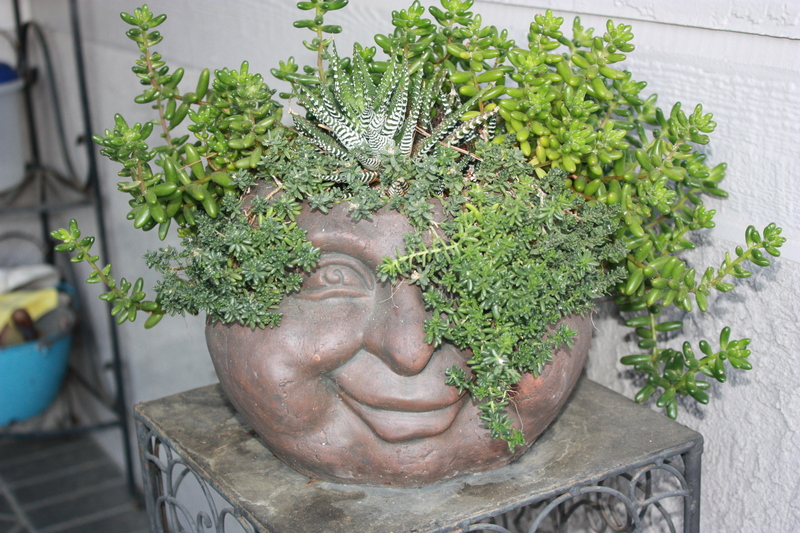 In addition to these qualities, of course, succulents are also becoming more widely used both in landscapes and containers because of their relatively modest needs (good drainage; occasional water). They’re really like the perfect dinner party guest—they quickly make themselves at home, they get along with just about everyone, and they’re not high maintenance. But here’s the real reason I like succulents, and invite many to live with me: They’re forgiving. Really, really forgiving. I like that in a relationship. You see, just because I write a gardening blog doesn’t mean I can always spend a lot of time gardening. In fact, in the whole month of October I am not sure I saw my own backyard more than twice, due to work demands and the usual shot-from-cannons pace of 21st-century life. So succulents, which overlook my lapses of memory and failures to carry out my own good intentions, are the perfect garden partner for me. If you haven’t had a lot of experience with succulents, let me show you what I mean. 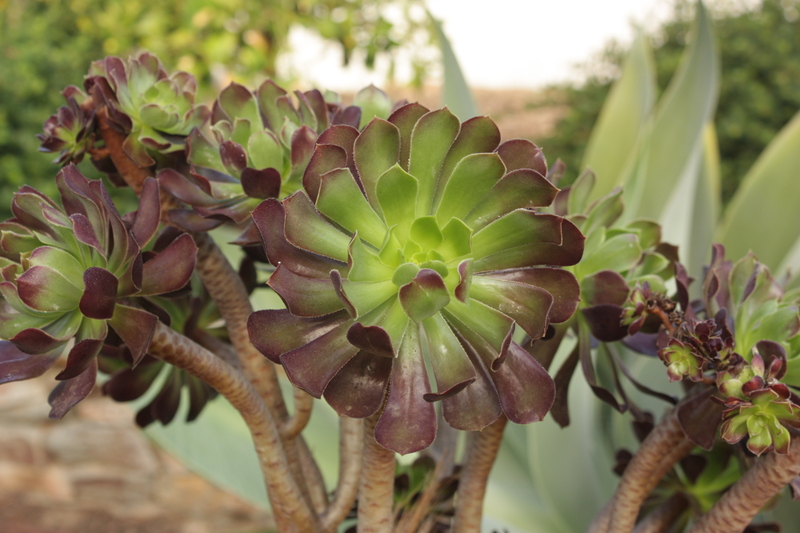 Here’s one of my patio pots planted with aeonium “Schwarzkopf.” Because it’s in full sun, on a stone wall and inconveniently far from a spigot, this pot often suffers from a double whammy of heat and neglect. 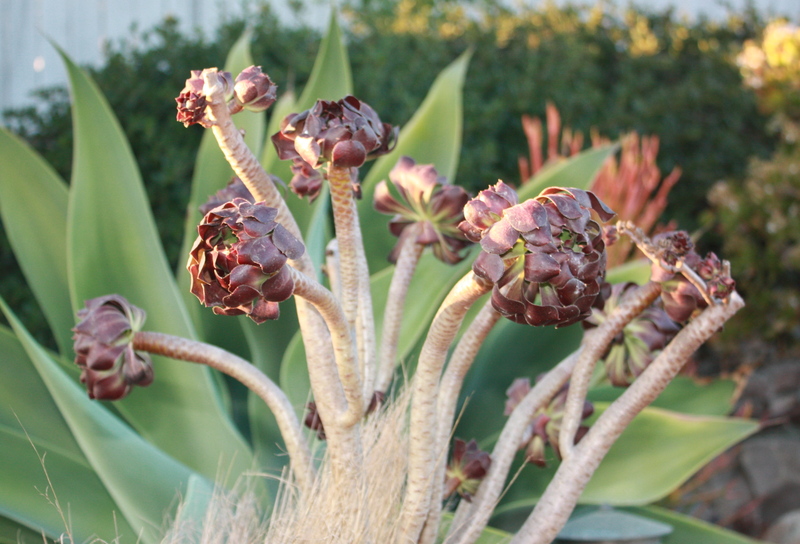 So when I did wander out a couple of weeks ago to see if the backyard was still there, the aeonium looked like this: I was not alarmed; I just whisked by it on my way to something else. And normally I would go right on ignoring it, because I know it can wait, and other things in the garden needed my attention, but it occurred to me that I could use this to dramatically demonstrate the Lazarus-like qualities of succulents. So I took the picture above, and then went and got the dog’s water bucket. I dumped the water over the pot, and came back the next day. I don’t mean to suggest that succulents can be ignored with no consequences. Drought and heat will alter their appearance. But here’s the thing—I can live with that. Sometimes the stressed look is actually cooler than the healthy look. As soon as they’re watered again, either by rainfall (what does that look like again? I’ve forgotten) or via the occasional dog bowl, all is forgiven. The past is forgotten, and you’re moving forward. And you can do this over and over again, and the succulent will never hold a grudge. If only all relationships were so elastic. So if your life includes long stretches of chaos, intense activity, or any other distractions which divert you from your gardening, consider succulents. Adaptable, self-sufficient, easy to ignore, and always forgiving—they’re the perfect partner in a gardening relationship. People say we don’t have fall in southern California. I beg to disagree. Oh, people will disparage what they see as our lack of seasons; in fact, I recently observed a raging Facebook debate on this very subject; the natives were insisting that we do have fall here, while the transplants from other areas disparaged our Octobers as “just more tepid than summer.” And then they went on to wax eloquent about New England. Now, having grown up in the Blue Ridge mountains, with its famous fall foliage displays, I do understand the yearning for home and the fall colors. And I also understand the profound sense of displacement when your surroundings don’t match your inner calendar. That happens a lot out here, and mostly we’re used to the complaining about it. But fall does happen here, and I thought I’d devote the next couple of posts to an appreciation of what Helen Hunt Jackson (herself a transplant to California) called “October’s bright blue weather.” And that is indeed the first sign of fall: the right-on-schedule, deep blue sky. 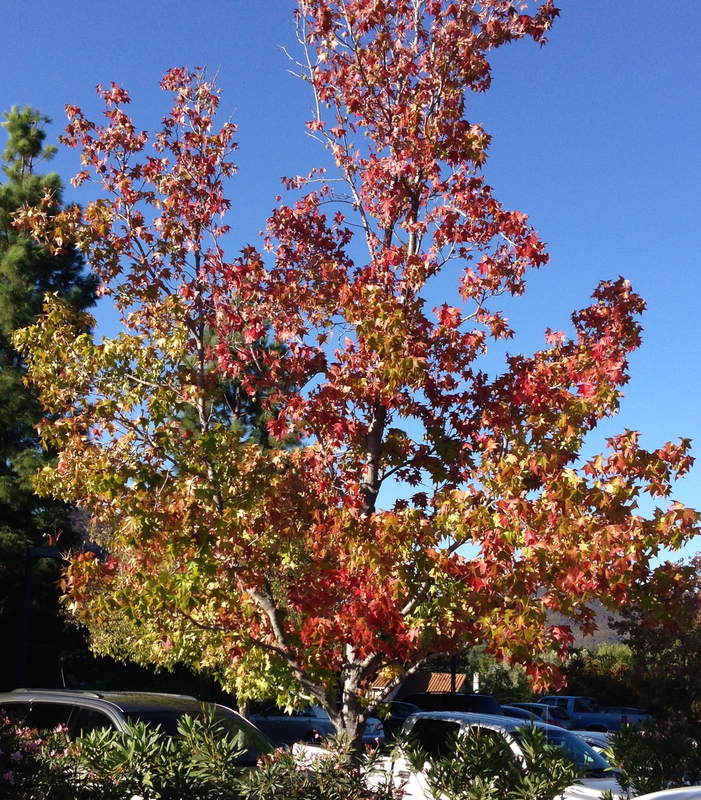 This parking lot liquidambar shows off our October sky. Then the temperatures drop. Yes! It’s a cool-ish 70 degrees on my patio right now! And—get ready—it can get even colder. Other seasonal markers are there once you know what to look for. 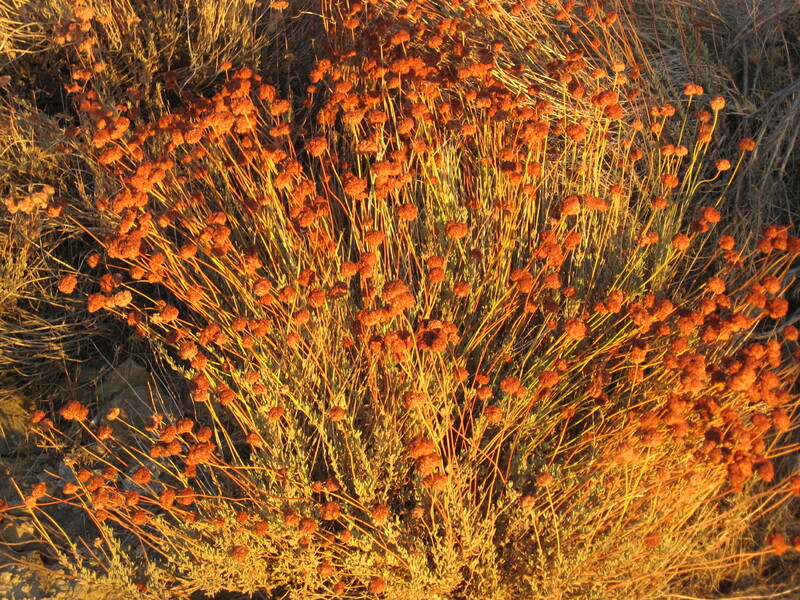 Below, a native erigonum (buckwheat) in the late afternoon light. The Chumash made pancakes from it—I just like to look at it. 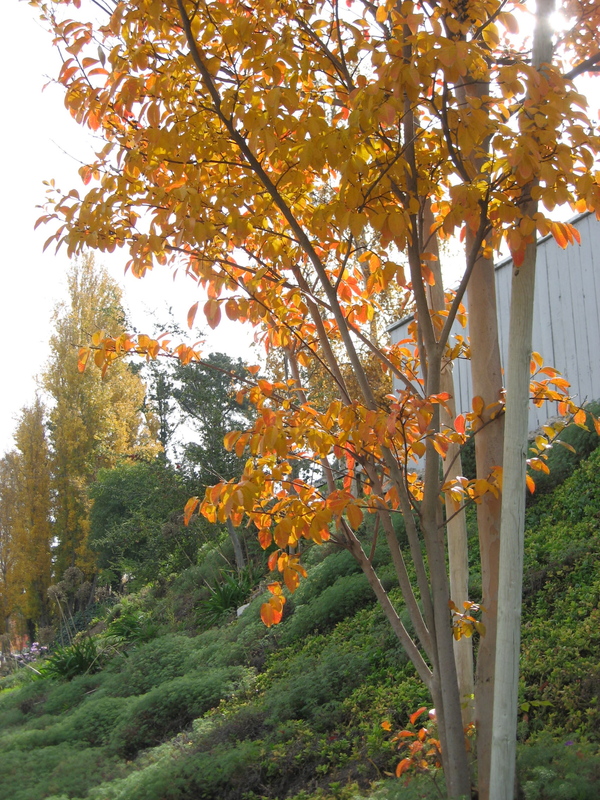 The Crape myrtle (above) is one of my favorite trees; I can devote a whole post to their graceful structure and four-season interest, but for now, I’ll just focus on their fall foliage–which can be beautiful. If you’re planting this tree for fall color, it’s a good idea to pick it out in the fall so you can see what you’ll be getting. Chinese pistache, above, is a lesser-known superstar; it blends in with any landscape in the summer, but in fall, look out. 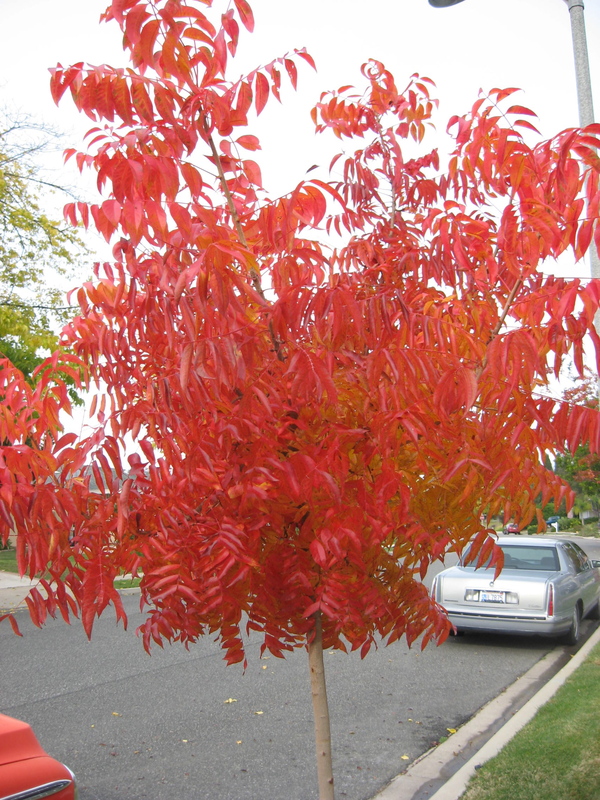 It turns the most amazing shades of red-gold, and will light up its location. 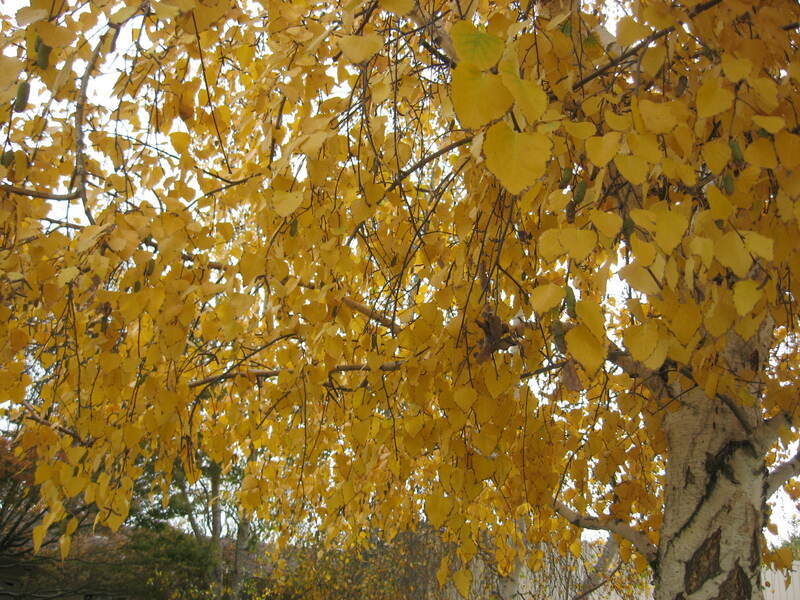 Birches, those landscape staples so beloved and so often stuck in the middle of lawns, turn a spectacular gold color this time of year. 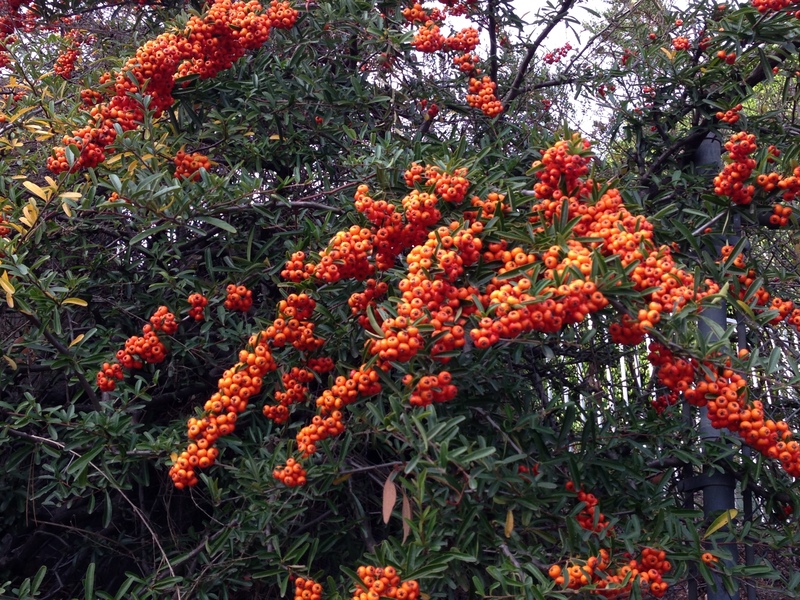 Pyracantha (firethorn, above) and chrysanthemums (below) add a lot of seasonal color; pyracantha berries redden in fall and continue to brighten up the landscape all winter long. And instead of composting your Costco or Home Depot mums when they’re done blooming, stick them in the ground, cut them back in January, and prepare to be amazed next October. 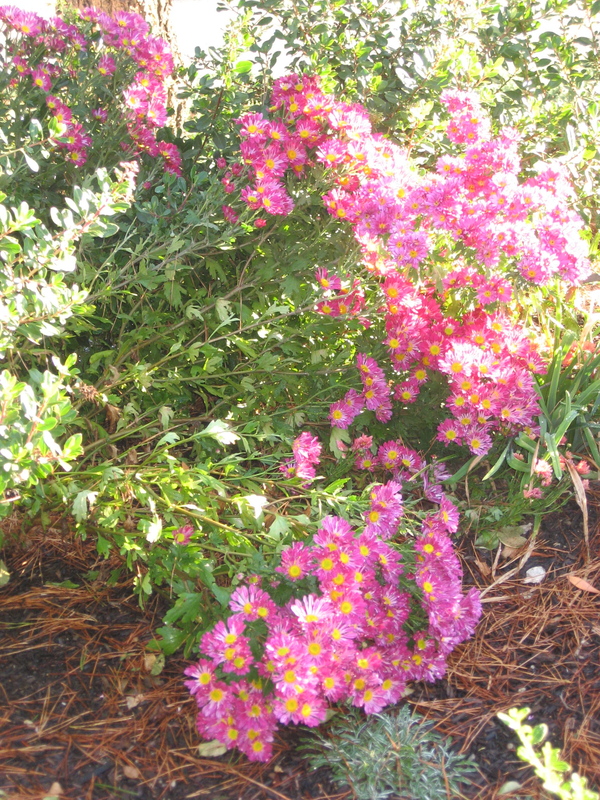 Above, an example of both crysanthemum’s fall color and my poor planning–these guys are reaching for some sun owing to the great success of the shrubs planted nearby. Some of the mums have decided to take a nap. So, yes, we do have fall, and it has arrived. Like the song says about love, it’s all around you. Let it show. And enjoy! Calling it a “Santa Ana event” makes it sound like a lot more fun than it actually is. 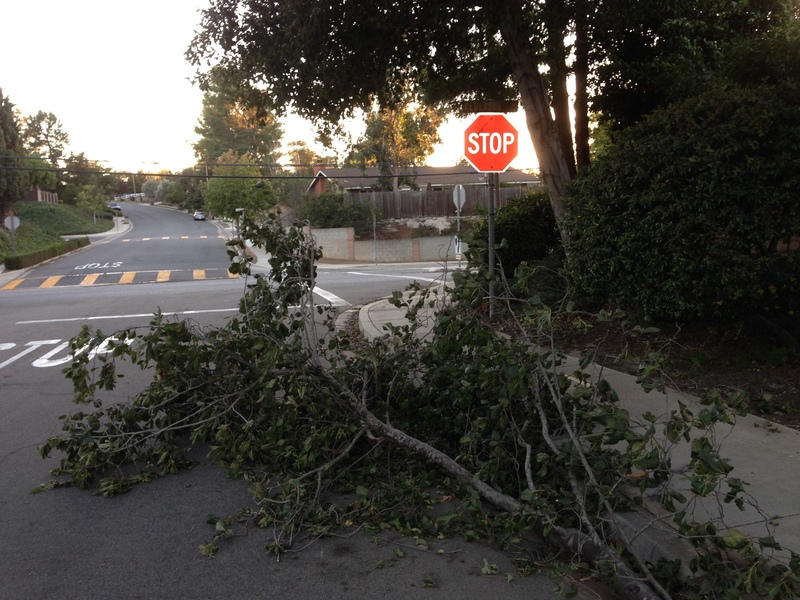 A familiar sight in our neighborhood in Santa Ana season. People ask me sometimes where I get my love of gardening, and I don’t know what to say, because I don’t think of myself as a gardener. “Gardener” has an official–hobby ring to it, and that’s not what gardening is for me. I’m not really sure I can say what it is. But I do say that whatever it is, I get it from my mother. Mama spent every available minute out of doors. Back in the sixties, before rural North Carolina land was worth much, Buncombe county had lots of what she called “old home places”–where houses or farms had stood and then fallen away. There was no one around to care or see what she did, so what she did was help herself—to old bulbs, violets, trillium, hearts a-busting with love; planted decades ago or springing wild from the ground; she knew every leaf and twig in the mountains. She could reach through a tangle of brush growing in the stone foundation of a vanished house, find a sprout the size of a fingertip and recognize it as she would a neighbor. Once identified, the plant would be liberated from its surroundings, placed in the back of our 1958 Chevy Nomad station wagon, and relocated to its new home in our yard. 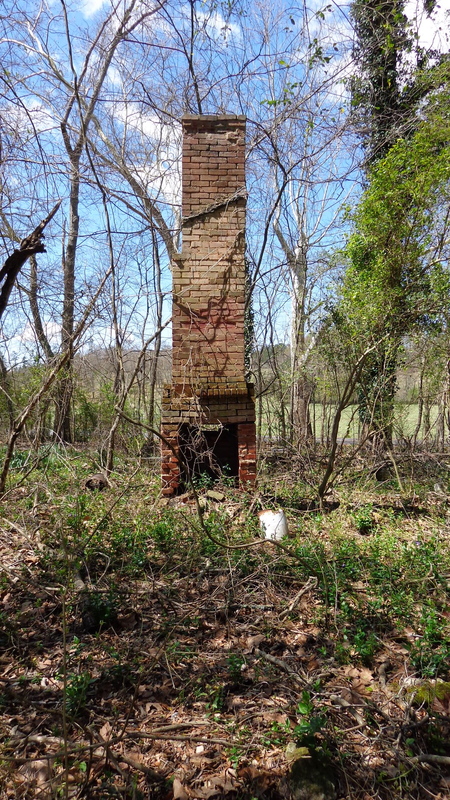 Often a chimney was all that remained of the abandoned properties that drew my mother. Mama kept an old army shovel in the back of the Chevy; it was a handy small size with a pointed blade; left over from Daddy’s WWII service, it was ready to deploy at the first sight of a likely bulb or sapling. We sometimes carried the shovel when we were forced into accompanying her on her excursions. Today I’d give anything to go along, but as a child, trudging beside her down those unused, grassy tracks into long-abandoned, silent clearings to bring home still more daffodils seemed a tragic waste of an afternoon that could have been spent watching cartoons. Eventually land values appreciated and the old home places started to be bought up; deprived of her supply, she branched out to digging up daylilies, butterfly weed, money plant, and anything else that appealed to her on the roadside. She even once, in a memorable episode, lifted some bedding plants from a McDonald’s parking strip. By this time, I was in high school, and why the embarrassment didn’t kill me I’ll never know. It was pointless to argue that this was stealing. She’d wave such concerns away saying that no one minded. When I returned home years later with my new husband, he joked that we should pay someone to dress up like a police officer and pretend to arrest her. I knew it wouldn’t faze her; that she’d be able to argue even a real police officer out of the charge by her unshakeable conviction—it was a downright moral imperative—that this was not stealing because these plants were actually supposed to be in her yard. The house, fairly light when we moved in, grew increasingly dark over the years as she refused to take out even the smallest tree. She liked the privacy; she wanted to be shielded from the eyes she was convinced would peer at us from the road. She was resolutely, intently moving the land into a new expression of itself; something older, something wilder—something that had communicated itself to her over the years of seeking and procuring. How did she know what it needed? She never said. But she was absolutely sure of herself and never hesitated, never fumbled, never consulted anyone else for advice. She just kept adding and moving and the yard evolved inevitably into itself; it was impossible for it to have looked any other way. Our house sat on two acres (“two acres more or less,” the deeds for mountain land read), and those acres were mostly wooded. Wooded was the way she liked it. Moss was plentiful; ghostly Indian pipe grew in the woods, where the leaf mold was inches thick. 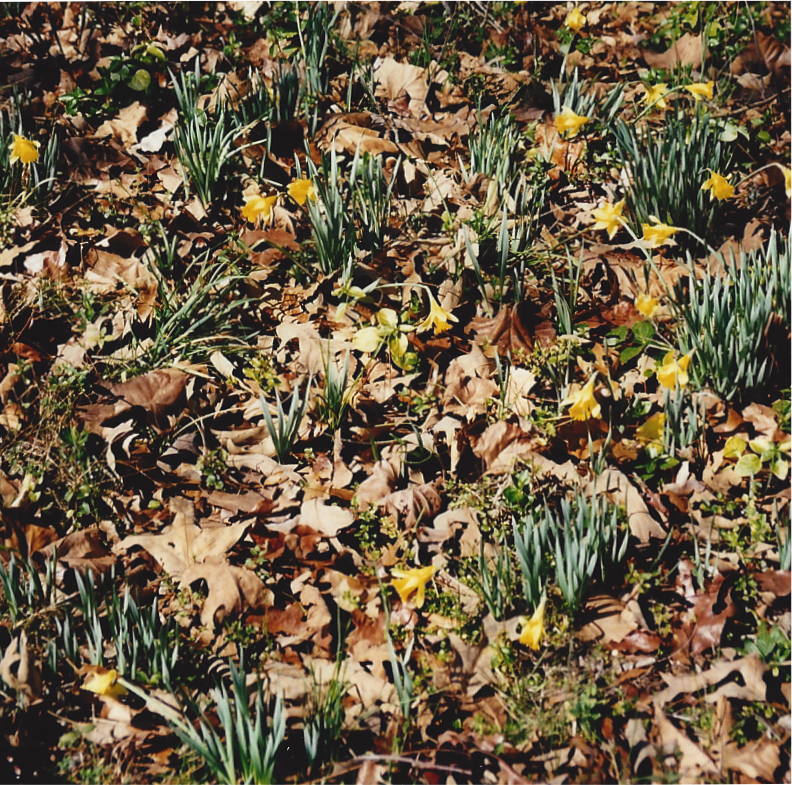 We had lots of leafy canopy, but the only things that bloomed were the ones that flourished in the shade; native rhododendron, early spring bulbs, violets—blue, dogtooth, Confederate—and periwinkle in the spring, pushing through the snow. 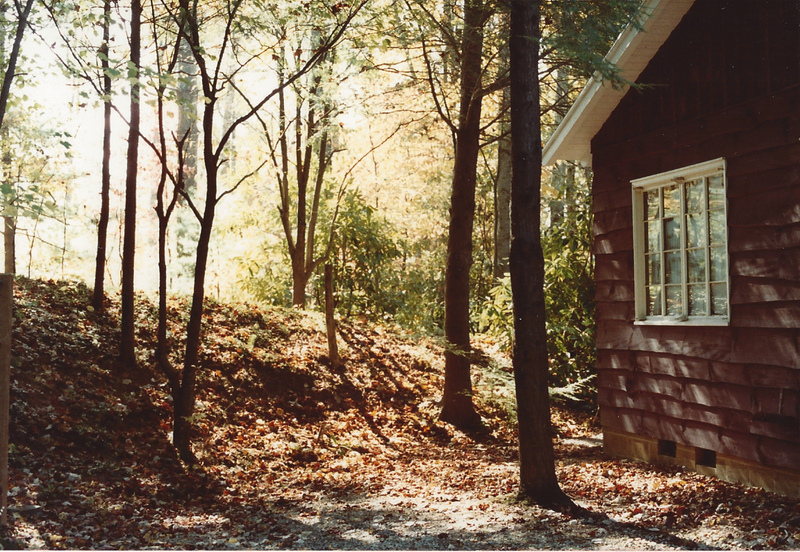 The yard Mama had brought into being was full of layers, depth and texture; trees to sit in; spots for us to hide and imagine that we couldn’t be found. It was quiet and seemed almost liminal, as though a child might step behind a tree into another, more mysterious reality. Every other house on our street was much more conforming—an open lawn, some foundation shrubs, maybe some marigolds. Their yards always looked too sunny and flat to me. No stories could be made up in such a yard. My mother wasn’t a gardener in the sense of gardeners who bring the same sensibility to the yard as they do to the interior design of their houses—decorating, fluffing, choosing colors of a unified theme, expressing their personal design aesthetic. My mother had to garden. It was the outpouring of her tremendous life force, of her sense of the natural world. Her will was enormous and inexorable, but she wasn’t so much imposing her will on the landscape as she was birthing it—giving it the life it had been waiting for. 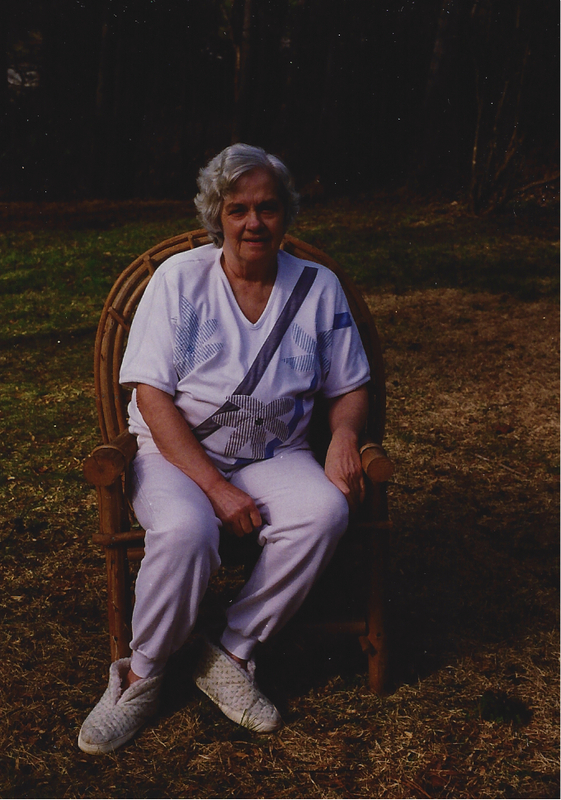 Even after she was ill with the heart disease that would eventually kill her, she would direct the yardwork with great conviction and assurance, operating out of her sure instinct of what should go where. Pulling around her oxygen tank, sitting on top of a five-gallon plastic bucket turned upside down, she’d issue directives to the biddable young man she’d hired, to plant this hosta and pull out that bittersweet vine. I never heard whether she made Todd stop and liberate plants from the roadside—but it wouldn’t surprise me. Not at all. 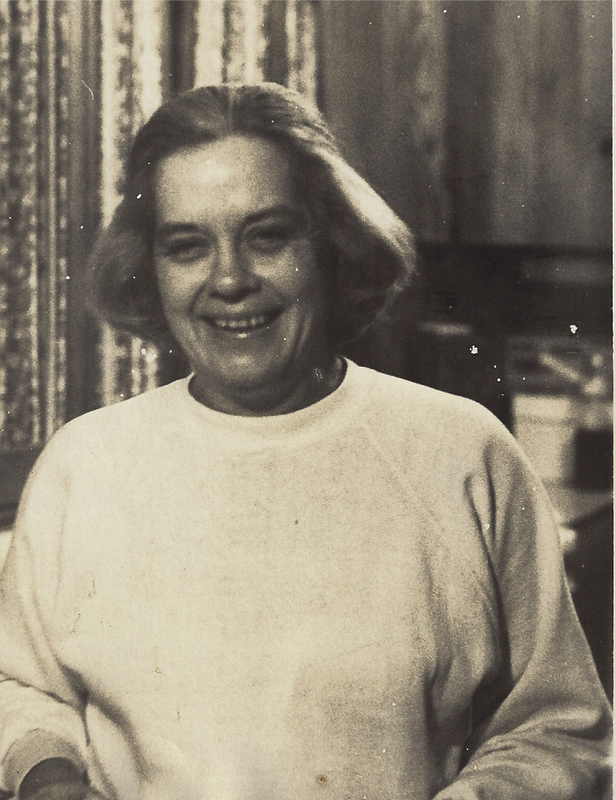 When my mother died, we held the service in the front yard, surrounded by all that she had brought into being. It was October, and the leaves were changing. On the porch, we placed a tall vase of flowers that we had—yes—stolen from the roadside. Next to it, we propped the army shovel. “Lawn” is not a four-letter word. Okay, maybe technically it is a four-letter word. But it’s a four-letter word you don’t want to mention in conversation with eco-purists and sustainability warriors. Mention “lawn” to the True Believer and you’ll get the same horrified reaction as if you’d dropped an f-bomb at a tea. The thing is, while broad, estate-style sweeps of lawn are going the way of the dinosaur, there are good reasons why you might not want to eliminate your lawn entirely: Kids and pets appreciate a spot to roll and play; there’s the cooling effect; maybe you hail from an area which is lush and green, and home is not home to you without your small patch of grass. Maybe it’s now a smaller patch of grass, but darn it, you still want it. 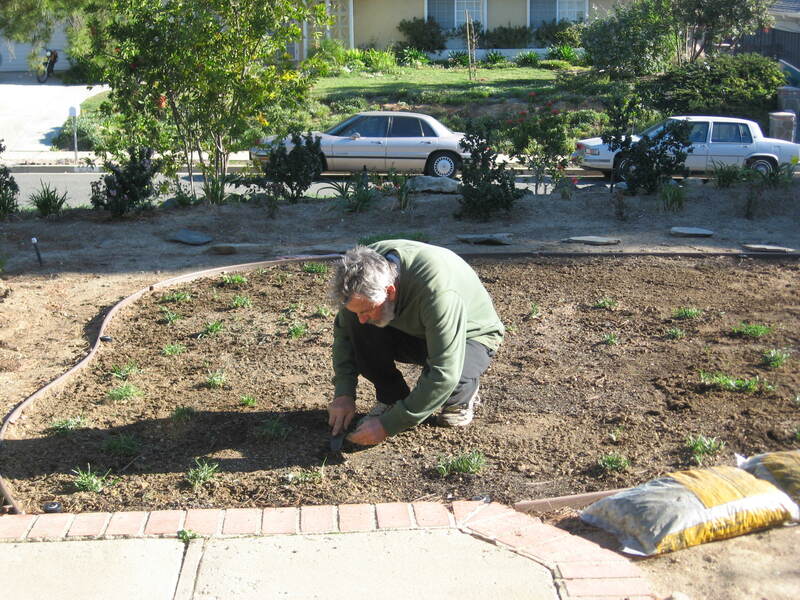 When we were first trying to figure out what should anchor our big, front-yard beds of perennial shrubs, we considered, and vetoed, many ideas—more shrubs, decomposed granite, gravel, ground covers like dymondia and myporoum. Each one of these, though, while water-wise, had drawbacks. I wanted to be able to walk across it barefoot (you can take the girl out of the country . . . ); we wanted a flat area so neighbors and visitors didn’t have to wade through knee-high shrubs; I’d seen a lot of lawn substitutes in my walks that just didn’t quite work. So I was pretty sure that little circular area surrounded by shrubs was going to be occupied by grass. So after a lot of resource- and soul-searching, we took the step (which was advised against at almost every turn) of buying two $8 flats of St. Augustine plugs at Home Depot. St. Augustine has a bad reputation, some of which is deserved: It spreads by stolons (runners), which can get away from you. It goes dormant in the winter, which offends some homeowners’ personal design aesthetic. two months later our little circle was completely filled. Two years later, the lawn (Yes! I said it! Lawn lawn lawn!) does send out runners, which we alternately weedwhack or pull to keep within its borders. 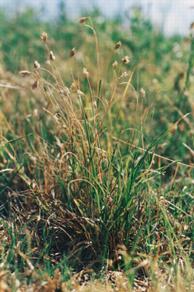 It does go dormant, though it turns kind of a drab green, rather than the winter-white of Bermuda grass. Which doesn’t bother me—coming from a four-season climate as I do, I expect grass to go dormant in winter. And, the best part—it requires about 75% less water than the previous Marathon lawn. So don’t be cowed by eco-purists. 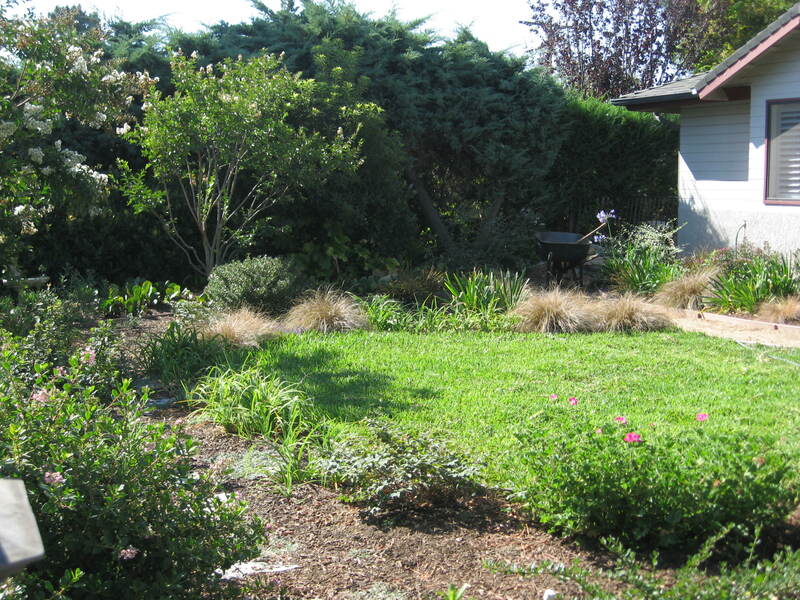 You can be sustainable and have a lawn. You can make it quite a bit smaller; you can replace parts of it with other things; you can use a different type of grass or even a ground cover. Sustainability doesn’t have to be an all-or-nothing approach; we can find some middle ground, and—who knows?—it might even be green. One of the many benefits to walking your neighborhood, in addition of course to getting closer to that elusive, healthy, CDC-recommended 10,000 steps per day, is that you get to see the infinite variety of expression possible in landscape design. You could also peruse the tidal wave of gardening and shelter magazines, and/or spend a lot of time on HGTV. But the advantage of your neighborhoods is you get to see what plants actually work in your area. And just as importantly, you get to see the infinite range of possibilities out there. Style arbiter Clinton Kelly says “If you’re pleasing everyone, you’re doing something wrong.” But most of us are not as bold or confident of the fabulousness of our own tastes as Mr. Kelly is, so we second-guess ourselves to death. And second-guessing robs us of a lot of joy. 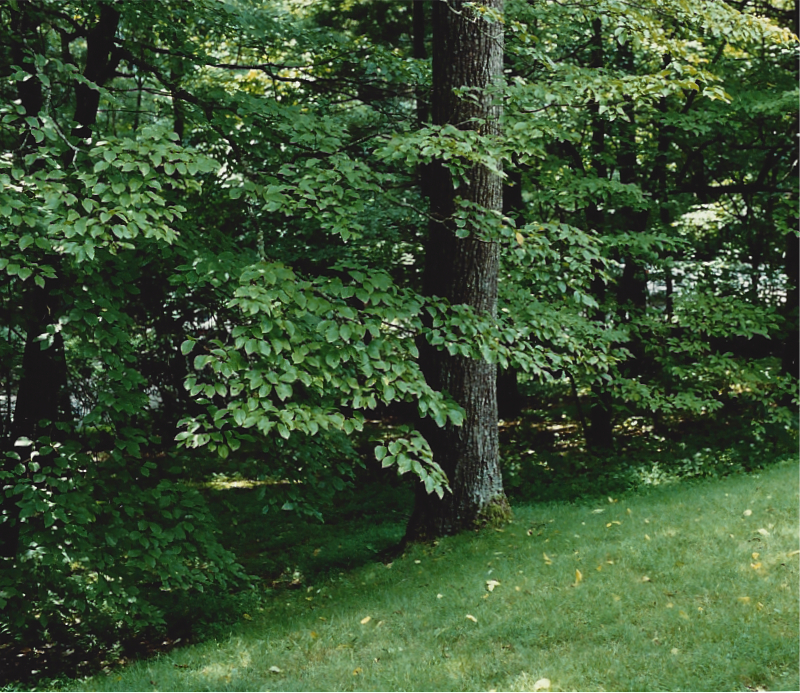 Often when we think about our front yards in particular, we immediately worry about our neighbors to the left, to the right, and across the street–and maybe any random home tours which might wander, unannounced, into the neighborhood. And there’s something to be said for that. Property values absolutely depend on the condition of adjacent homes, and what you do will have some effect on your neighbors. And you may even be—and if so, I’m sorry—in one of those neighborhoods whose HOA dictates down to the color of your annuals what you can and can’t plant. That is a serious bummer, and I suggest you overthrow them in a bloodless coup. But we are back again to your impetus for taking to the streets (and going back to your word list); think about what would make you happy. I don’t think we give that enough consideration. And whether or not we realize it, our physical space has a lot to do with our happiness. Now I ask you. Can you imagine a more potent design team than that? His aesthetic isn’t going to work for everybody, but his yard makes him happy, and it makes me happy because it so clearly expresses the designer’s joy. My joy looks very different—yours will, too. But do make sure you consider your joy an indispensable element of your landscape planning.